Are you traveling and want to learn how to haggle? In the post, we offer tips for haggling around the world with 17 unique haggling experiences. Some people hate the idea of haggling. Some people love the thrill of it. Either way, it is most likely something you will have to do at some point in your life. We’ve asked fellow bloggers to give us some insight into their experiences with haggling in the hopes that you can learn a thing or two and feel more comfortable the next time you find yourself bargaining for that treasured item. I admit that haggling is one of my favorite things to do – but only when I travel and in only in some countries. Especially in the United Arab Emirates, and in particular in Dubai, I love showing off my bargaining skills and here are my top tips when it comes to haggling in Dubai (in shops inside malls haggling is less common but I definitely recommend it when shopping at the souks/markets). The gold and spice souk, where you can also buy souvenirs, carpets, affordable clothes and all other kind of stuff, is made for haggling. The prices are lower than in the malls but you can still get way better prices if you don’t give up easily. You can haggle over everything even on spices. When visiting the area (btw: the souk should be on every Dubai itinerary) make sure to ALWAYS haggle – never accept the first price mentioned. But to be most successful, I recommend to be polite, not too serious and always be friendly (even when the prices seem ridiculously high first). Laugh when they name a price, pretend to be shocked (even when it is a good price to you), and name a price about 1/3 of it – and haggle their way through until you find a price you are comfortable to pay (often about 1/2 of the original price). The sale persons at the market can be quite intimidating first but if you are friendly and polite, this can be so much fun. You might end up buying things you don’t need, but it is actually a fun thing to Dubai and I recommend to try it at least once – even if you aren’t normally into haggling as it is easy to do so at the souks. Haggling’s a sport in India, they expect haggling so prices are suitably inflated. We traveled to India with our three kids and visited Agra and Jaipur. We had no intentions on purchasing carpet or white marble but somehow we returned home with both carpet and white marble! Most tour guides will take you to a carpet and/or marble factory, a bit like that gem factories in Thailand. The art pieces are impressive and all hand made. I started with a strong resolve on our first couple of visits, then we hit the white marble factory and I my strong resolve started to whither. I’m a strong advocate for taking home something that reminds you of your holiday so those genuine hand made products really resonated with me. We started with we’d love to purchase one but the price is way off our budget. This is where the haggling starts. I tend to suggest half the price and then haggle up from there until we reach the maximum price we are prepared to pay. I think we certainly paid more for our purchases in India but in the end I’m happy with what we paid and I’m glad that both pieces are in our lounge room and used and admired daily. Last Spring I visited Bethlehem with my best friend. I’m not really a fan of souvenirs, but he really wanted to buy some nativity sets and shawls for his friends and family, so we set off to one of the shops in the city centre. We were quoted prices in USD, and everything was extremely expensive – like $250 for a small nativity set and $30 for a shawl! He was going to pay what they asked, which would have set him off $400 or more, when I told him that perhaps he should try asking for a discount – which kicked off the usual ‘haggling process’ that is common throughout the Middle East. I think haggling in places like Bethlehem, or even in the Old City of Jerusalem, is common, at least in some places. After a little bit of back and forth we reached a price we were all happy with, my friend walked out with souvenirs and the shopkeepers got their money. My tips are for haggling effectively are knowing the ‘real’ (i.e. not inflated) price of what you want to buy – shopping around and looking at various stores helps you understand that. Also, please don’t be disrespectful and haggle over a few dollars, especially in a place like Bethlehem where movement is severely restricted and those souvenirs are the way locals make their living. Hoi An in Vietnam is famous for tailor-made suits, dresses and shoes. When I visited Hoi An I decided to buy a pair of custom-made shoes from a shop just outside the market, which had lots of cute models placed outside the door. When I first asked the prices of the shoes, I was told that a pair would cost around £25 / $33 USD. I’m not very good at bargaining because I always feel bad about trying to knock the price down, but after quite a bit of back and forth I agreed to buy TWO pairs of shoes for around £16 / $21 USD each. I felt very rushed and flustered. Once you go into a shop and someone grabs hold of your foot and starts measuring, it’s quite hard to say no! When I left the shop I regretted that I’d bought two pairs, and the amount was more than I’d wanted to spend (I was a solo backpacker with not much spare cash). I’d been caught up and confused by all the haggling! In the end the shoes were a TERRIBLE buy and bad value, despite the amount I knocked off the price. I saw very similar shoes advertised in shop windows elsewhere for a cheaper starting price than the one I paid. When I first arrived to pick them up they didn’t fit and the cobbler had to re-do them (if I hadn’t been staying in Hoi An an unusually long time I’d have lost my deposit and had no wearable shoes). AND they broke almost instantly. I don’t mean they became a little frayed, I mean that both pairs broke comically in half and were totally unwearable after literally one or two wears. I know people who were very happy with tailor-made dresses they bought in Hoi An, but I’d advise against getting swept up in bargaining and buying shoes! Before heading to Nepal, I was told not to buy all of our gear from home as there are some great shopping opportunities in Kathmandu. And for sure I am glad I listened to everybody. I desperately needed a good backpack, so my expectations were pretty high for the Nepali market. As such, one of our Nepali friends told me about a couple of shops from where I could buy some decent quality products. I have to admit I was a bit reluctant after hearing the word decent, as I had read on various forums that you will mostly find cheap original fakes in the Thamel area of Kathmandu. Nevertheless, I ended up visiting one of the places my friend recommended to me. I am the worst at haggling, I always feel wrong doing it, but this time I needed it. So I put a massive smile on my face, saw a really good-looking backpack and started doing some small talk with the owner of the place. After ten minutes of talking and getting to know his family, I got down to business. Of course, the first price he offered was way too much for my budget, so I was honest and told him that I could not pay more than 30USD for a backpack. After some back and forth he just smiled and said that he agrees. And no, this isn’t a 30USD backpack, its quality is excellent and has been worn a bunch of times. But it was also fun buying it, testing my haggling skills. No trip to Mali’s bustling capital is complete without a visit to the Gran Marché of Bamako. Spanning several city blocks, the market features an artisan’s section, miles of choices for fabrics, any trinket you could possibly want, and creepy “fetishist” stalls where witch doctors can recommend an alternative cure for whatever ails you. If you’re looking to buy something, make sure you haggle for your life. First prices will generally start at an absurd markup, so feel free to counter with 2/3 off. The vendor may feign insult and reply with a meager 10% off the original price, to which you must feign insult. Carry on as such until you arrive on a price you can both agree on. Bargaining, haggling, or discuter in French is not only expected, it’s a tradition that the locals delight in sharing with visitors. Using this method, I was able to purchase art, gifts for friends, and various pagnes (beautifully and brightly printed fabrics) to be made into dresses and skirts for me to wear. After traveling extensively around Southeast Asia, I was already used to haggling and bargaining on a daily basis. However, my recent trip to Egypt put my haggling experience to a new level – if you don’t know how to haggle when visiting Egypt, you will be broke and ripped-off immediately. Especially public transportation, such as taxis, required all possible haggling skills. My advice: take an Uber whenever you can, especially in Cairo. However, Uber was not always available, and I had to take taxis every now and then. My first recommendation is to agree on a price before you sit inside the car. Now before how much roughly the trip might cost, tell the driver what you’re willing to pay with a confident voice and if he neglects, keep walking. Sometimes, I had to jump into a taxi immediately because of traffic. In this case, I asked directly for the price and if it was too high, I requested the driver immediately to stop and jumped off the car. It got especially annoying when you agreed on a price before getting inside, but if the driver starts re-negotiating as soon as the vehicle is moving. Here there’s only one thing to do: be strong, determined, be very clear in what you’re paying and if this is an issue, immediately get out of the car. I’m always trying to be polite and respectful when traveling. But unfortunately, in Egypt you have to be rather strong and self-confident if you don’t want to get ripped-off completely. Haggling is among the recommended things to do in Cuba, one that you need to get skilled at in order to avoid all the scams the country is famous for. If haggling is necessary when buying souvenirs such as cigars or bottles of rum, it is an absolute must when getting a taxi. Fees for tourists tend to unreasonably be 10 times higher than those for the locals, so it is a safe assumption that, if the driver suggests a $10 price for a ride, the actual cost is no more than $1. The best way to haggle for a taxi in Cuba is thus to have a back up plan. Walking is safe, and the public transportation, even for long distance, works quite well. So, if a cab driver shoots sky-high prices, saying a firm “no gracias” and walking away will already work the magic. Chances are that the same driver will suggest a lower price, and that’s when you start making your price. Continue haggling until you reach a price that you think is reasonable and that you are willing to pay. Whether it’s for peppercorns or parakeets, cashews or curios, haggling in the markets of Cambodia is expected of you, so time to get on with it! You may find it unnecessary, uncomfortable and a little unnerving, but this is reality. And even if you’re feeling generous, studies have shown that refusing to haggle merely pushes prices up for locals in the long run, so as long as you’re respectful, it’s time to swallow your pride and figure it out. In Cambodia we learned to haggle for everything. Even in the supermarkets prices were often not set, so we had to have our wits about us and get to know the real value of things. Our top tips? Learn some of the local language (even hello and thank you will put you in good stead), speak to locals in your hostels or hotels about the normal cost of items you intend to buy, treat it as a game, but always be respectful, and get there early. There is a lot of good luck associated with the first sale of the day, so arriving early can get you a bargain on the bigger gifts you want to take home. Granada in southern Spain is home to many ethnic markets that sell souvenirs, mainly to tourists. While walking one of these markets I saw some beautiful scarves in jewel colors and silky material that I wanted desperately! The marked prices were 15-22 Euros each and I felt that if I got them for 25% less, I would be getting a deal. I picked out a few and offered the shop owner 50% below her asking prices, having learned that strategy online. She threw up her hands and exclaimed that her scarves were the best in the market (which they were) and that the marked prices were completely reasonable. She grudgingly offered 10% off. She was a master negotiator! I shook my head and said “too much” and started walking away, expecting her to call me back with a lower offer. But she didn’t. I was disappointed and my husband asked me if we should just pay her the asking price, but I said no. I picked up other gifts and our arms were laden with bags when we purposely walked back past the scarf shop. The owner looked at the bags in our hands and I saw her expression change. She called out a price 25% off on my favorite. I quickly countered with 30% off and she said yes!!! I bought five scarves, pleased with my haggling skills! By the time I found myself in China for a second time, I was feeling a little cocky about my bartering and haggling skills, as I’d negotiated for virtual troves of souvenirs during my last visit. On this trip, I really wanted to find a coat with the Mandarin style high collar and embroidered hems. When we came across a store in Xiahe selling a beautiful selection, I was thrilled and set my sights on achieving a certain price. I used all the tactics I knew, but the proprietor would not come down as far as the price I wanted (USD$12). So I walked away. 75% of the time, the seller will call after you and offer the lower price. Not this time. My husband had been beside me, disapproving of my stubbornness. I went back to our hostel and began some email correspondence at their computer, putting the coat out of my mind, figuring the next one I came across, I wouldn’t be such a hardass. Well, as the trip went on, I found myself more and more disappointed as I never saw another coat like that one, not even in Beijing. I had messed up and missed out. I should have reconsidered my price and gone back to accept the lady’s offer. So, we got home from China and were unpacking our backpacks, when my husband pulled out from the very bottom of his pack that coat from Xiahe! While I was at the hostel computer, he had sneaked back over to the shop and bought the coat for the price I’d haggled down to (USD$14), then hauled it around secretly for the rest of the trip. So I was rescued from my mistake, but the lesson was learned. Recently on my visit to Sikkim last year in the month of October, I found myself in a bargaining situation with the shop owner over the purchase of a Sleeping Buddha. The sleeping Buddha was a few feet in height and a few inches wide cloaked under an aluminium coating. I was very much interested in getting it for my family for the well being of the house. The price that the shop owner charged was quite exuberant and I had to literally get into a fight to calm him down and go for the exact price. He almost charged it 5 times the actual selling price of the item. That made me angry and get into a dispute with him regarding the cost. We quarreled for over 2 hours and it was one of my worst haggling experiences with a shop owner over the purchase of a souvenir. Finally he gave it to me at double the selling price which gave me some satisfaction and pleasure. Although I was disappointed by his behavior and the dispute that we got into, but I was able to tuckle the product during the trip visit. My most surprising haggling experience came at the International Market Place, in Waikiki, Oahu, Hawaii. Although it had a similar design and set up to some other markets that I had visited around the world, I was not expecting a negotiation session. Although Hawaii has its own amazing culture, it is still a US state, and haggling is not a typical American shopping experience! There are some unique and handcrafted items, but in truth, many items will be duplicated repeatedly, and some can even be found in the ABC stores. Nonetheless, we bought many items. The favorite ended up being a wooden keepsake box, carved into a sea turtle. It gets easier to name the price, but I felt it was important to pay appropriately when I did find those one of a kind handcrafted items, knowing this was how the artist was making their living. Haggling was a big part of our Latin American adventure; everything from buying food at local markets to paying for tours was a “haggling battle”, luckily I speak fluent Spanish which made it much easier. Once in Cusco, Peru haggling helped us to get a really good deal – Salkantay trek to Machu Picchu with everything included; transportation, accommodation, guide, porter, food and Machu Picchu entrance tickets for only US$170 per person. We booked a last minute tour one day before the departure; probably it was one of the reasons we got it for so cheap, lowering the price from the original $300 was not even a massive battle. Our main strategy is not to look too interested and excited about a tour, kind of “just shopping around”, still deciding if we want to do it or not and trying to ask questions that we will likely get negative answers for. The tour ended to be really good value for money for us and as we calculated later to do the trek on our own would cost us the same if not more expensive. With all these tours it’s always cheaper if you shop around and try to find the best deal, online booking usually results in paying a lot more. For example some of our tour mates booked the same tour online through an agency and paid 3 times more than we did. The iconic souvenir from a trip to Iran is a famed Persian carpet. Handmade and dyed in gorgeous colors, Persian carpets can run you anywhere from $200 to over $10,000. When I was traveling in Iran, I promised myself I wouldn’t come home with a carpet and a much lighter wallet, but once I entered a carpet shop in Isfahan, I was convinced. Before you start haggling for a Persian carpet, you’ll need to know the quality and type of carpet you’d like to buy. Carpets range in material, colors, and knot size. More knots = higher price, and silk will run you a lot more than wool or cotton. It’s also helpful to check a few different stores, both inside the bazaar and outside of it, to get a good feel for the pricing. Then, when you’re ready to haggle, keep a desired price in mind. It will REALLY help you to have a trustworthy Farsi speaker with you in the store in order to help you haggle. In my case, my tour guide helped me out, because he was able to help me figure out what a reasonable price was for each of the carpet types. Many carpet sellers may try to upsell you on a nicer carpet – be sure to be prepared and stand your ground on the one you want. Don’t be afraid to walk away from a shop and check a few different places around the city for comparison pricing. Also, be sure to try and get the price of shipping the carpet (if you need it) included in your final price. My first trip as a solo traveler was to the Turkish city of Istanbul. I was in awe the minute I stepped in and I was very keen on exploring the bazaars. I was taken aback, to say the least by the many shopkeepers at these bazaars. Typically, they would catch you looking at various products and invite you in just for a çay. And in no time, I found myself stopping by various shops, chatting with the good-looking shopkeepers over a flavored çay and some honey glazed nuts, getting an insight into the products and local life of the city. The biggest challenge was to resist the temptation to shop it all. Especially the souvenirs! I remember heading to the Spice Bazaar in Eminonu on my last day in the city. I was to buy some spices for my mom who loves to cook. I eventually ended up in a shop, where I was quoted lesser for certain prices and I began to haggle showcasing my intentions of bulk buying. I thought I was playing with the shopkeeper’s mind who would often give in to my demands. It was when I walked out that I realized that I was the one who got played into buying more than I needed, spending twice my budget. I tried making amends by walking back and telling the shopkeeper a make-believe sob story of running out of money for the rest of my trip due to the excessive shopping. After much insistence and my attempts at making an innocent puppy face, he took back some products and returned the cash. I don’t think I’d trust my self-controlling abilities while shopping, ever in Turkey but it’s the experience that I enjoyed and would love to go back to. During our trip to Thailand, we wanted to see as much of the country as possible but were on a pretty tight budget. We had just gotten to Krabi in the Southeast region of Thailand and were walking around one of the main streets when we started seeing signs for island hopping tours. Taking an island tour in Thailand was something we had hoped to do. The photos we had seen prior to our trip made the Thai islands look so heavenly! Something we’d learned from our years of travel, however, was to never say yes to the first person that offers you something. Whether its a a tour or souvenir, it’s always best to look around a bit and compare prices. After passing multiple people trying to persuade us to buy their tour, we ended up going to find some dinner. It was on our way back that we finally chose a tour. We paid what we thought was a reasonable price and even persuaded the guy to pick us up at our hotel. The next day ended up being one of our fondest memories of Thailand; its islands truly are magnificent! Haggling is a way of life in many countries, and like most things, it takes practice. 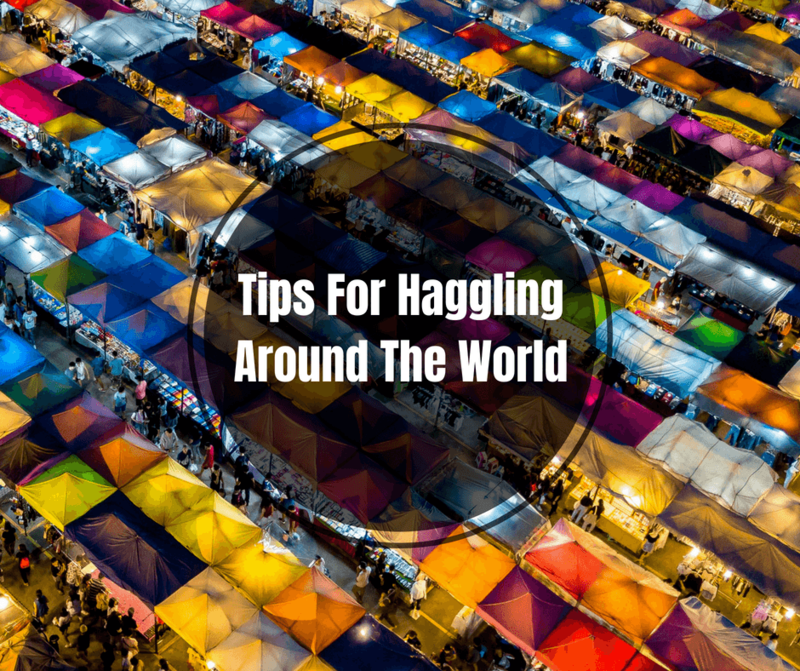 We hope that these experiences and tips help you feel more confident the next time it is your turn to haggle.